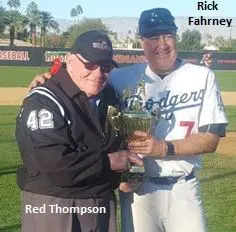 January 16, 2017, Palm Springs – Led by a complete game effort from Mark Schneiderman and good timely hitting the So Cal Dodgers defeated the Tri Valley Giants 10-1 to win the 60 and over division championship at the MSBL Palm Springs Desert Classic for the third time in seven years. The Dodgers scored first in the bottom of the second on an RBI-single from Marc Axelrod that scored Jack Sills for a 1-0 lead. The Dodgers then put together four consecutive singles in the bottom of the third inning for a 4-0 lead and then added six runs on four doubles in the bottom of the seventh for a 10-0 lead. Schneiderman didn’t allow the Giants to get a runner past second base until they finally scored their lone run in the top of the eighth inning on an RBI-single by Mark Weathers. Scheiderman pitched a complete game, giving up one run on six hits while striking out six. Lance Parker and Jesse Woods each had two doubles. Sills had four hits, two of which were doubles while scoring two runs, and Axelrod chipped in three RBI.